So this is the latest in a line of Christian films from the Kendrick Brothers, although this is the first from their new production company. They have stepped away from Sherwood Pictures, but they were the driving force behind "FlyWheel", "Facing The Giants", "FireProof" and "Courageous". Following on from the popularity of these films War Room follows a similar theme, certainly to the ones which I have watched. A couple Elizabeth and Tony have a fractured marriage. He is a top sales person for a Pharmaceutical company flying all over the country and rarely home. Elizabeth is a part-time real estate agent and a full time Mum to their 10 year old daughter Danielle. In the short times when Tony is home they end up arguing and he spends more time at the gym working out. The family occasionally attend church but this has become more about appearance than anything else, and it is clear that Tony has wandering eyes. After another argument Tony leaves for the week for work and Elizabeth calls at the house of an older lady to assess the value to put it on the market. This lady asks some very awkward questions before revealing her favourite room of the house. The Kendrick Brothers know the power of using film as a medium to bring across a message. Once again it is the familiar theme of marital breakdown (similar to Fireproof and Courageous), but this makes sense as many Christian marriages fail, and it's not something that anyone desires to happen. It's a familiar theme because it is very real to us. 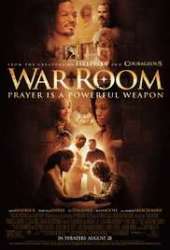 Here though the theme is prayer, it is to commit to praying in your closet, your War Room. Now it's fair to say that not all of us have the closet space that the people in this film enjoy, but the idea that there is power in prayer is a key one to the Christian life and speaking honestly for myself, it's one that it's all too easy to forget. If we don't forget it entirely then we throw up the odd prayer here and there. This film though is about determined time to sit and bring our thoughts before God in a structured strategy. It's a powerful message and with the medium of film and some pretty decent acting from the main cast members it brings the message home well. The issue for me, and if I remember correctly it's the same in all of the films, God always answers the prayer that is prayed in humility and desperation right away. This gives an unbalanced view of God, if I aim to pray in this way then God will do what I want. It simply doesn't happen that way. I have prayed so hard, so earnestly, believing God for an answer for a healed marriage, for a healed body and for a healed mind and those prayers that I have prayed were never answered immediately and God had something different in His plan for those circumstances. Don't get me wrong GOD CAN step in and change the circumstance as this film shows, but the truth about prayer is that it changes the one praying. There is a slight view of this in this relationship but the focus is definitely on the big things that happen! Having said all that I did enjoy this film. I loved the faith and determination of "Miss Clara" played brilliantly by the much younger Karen Abercrombie. She is such a 'character' that it is hard not to like her as she brings the central message of the movie. The prayer monologue at the end is incredibly uplifting and gives you a great feeling when you finish watching this film. At times the script is a bit heavy but the gospel message is clearly laid out, in a way that it probably wouldn't be in natural conversation. There are some moments of comic relief, but there really should be more to lighten this film slightly. This is still a powerfully moving film that many churches may want to use as part of their outreach campaigns, but I think in honesty the power of this film is it's message to believers. Pray, pray believing, pray determined, pray as part of a strategy because we are in a battle. This is a film that is positive and has a great message. It made it to number 1 in the US box office on it's second weekend of release showing that, in the US at least, there is a market for this message on a national scale. There are some faith-based in-your-face moments but overall this is a feel-good film that has a message to give and it has certainly given me a kick to make sure that I spend more determined time in prayer.